Lovely, spacious apartment with sea view. Heated pool and children's pool. Our lovely, spacious apartment is situated on an attractive well maintained complex close to shops, restaurants, the marina and seafront. It features a very large south facing balcony off the living area, which is ideal for relaxing and enjoying meals. The second bedroom has direct access to the main balcony. Another balcony, leading off the main bedroom, gives a more private area for breakfast or just enjoying an evening drink. 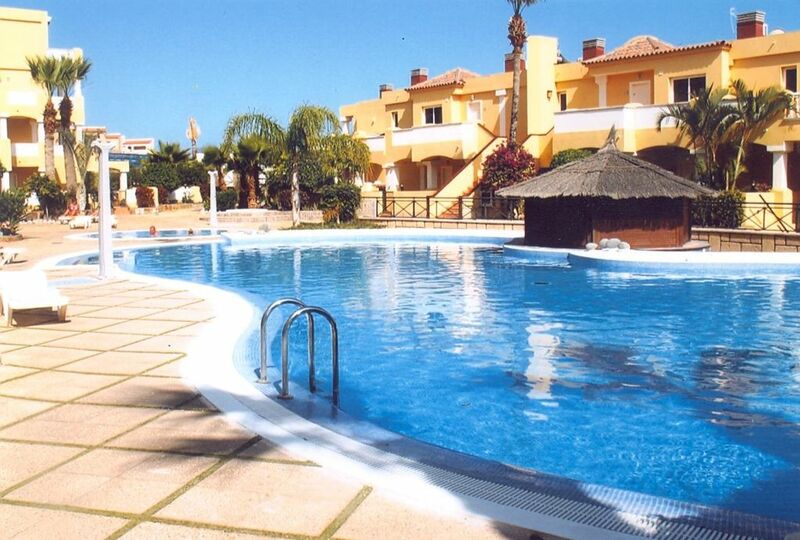 The apartment opens onto the heated pool area with a children's pool. A lift gives access to street level and a small supermarket. Our apartment is maintained in excellent condition by a couple who live nearby and are always ready and willing to give advice and help to our guests throughout their stay. Golf: Golf del Sur is, as the name implies, an ideal venue for golfers with 3 first class courses in the immediate vicinity of our apartment with driving ranges and professional golf tuition if required. There are many other golf courses in the south of the island within short driving range - no pun intended! Trips and other activities: Enjoyable boat trips, rides up the 12000 foot Mount Teide and other excursions are easily booked at nearby agents. The marvellous wind surfing beach of El Medano is a short drive away and the town has some excellent restaurants. The Winter Gardens complex next door to Duquesa del Mar has a 6 lane outdoor bowling green with beginners welcome and lots of fun! There is a diving school in the Marina with one on one tuition for beginners. If you hire a car, there are many picturesque villages to visit and sites to see. Semi-retired couple enjoying holidays in Tenerife particularly in Winter months. Reasonably sized complex kept in good condition with excellent facilities nearby. All year round pleasant climate. We have had many guests over the last ten years who have returned for a second and third time as our apartment and area are welcoming with all basic facilities nearby including an excellent A & E should you need medical attention. Our apartment has a lovely view out to sea from both balconies. Very roomy with comfortable bedrooms and all amenities. Comfortable sofa beds for children make our apartment suitable for up to 6 people. It's on the same level as the pool and ideally situated for all the local facilities - restaurants, sea, shops of all sorts, golf, bowls etc. Not Pool towels - please bring your own. All basic kitchen facilities including coffee maker, fridge/freezer, microwave, electric oven etc. You can plug in your ipod or ipad as well as usb and sd card sockets - please treat with care!! A variety of books and plenty more available to borrow from the office on the ground floor. Banagram a favourite with us and Rummikub is fun too! Playing cards. Mostly Easy listening and classical. Small balcony off the main bedroom is where we often have breakfast or a coffee in the morning. Large balcony is ideal for entertaining friends and enjoying sunshine. Large terrace with a view out to sea. Smaller terrace off main bedroom - same view. New 42" television added February 2012, which you probably won't watch often as the weather is so good!! Also small one in main bedroom. Absolutely great place to relax and enjoy beautiful weather! We had a great time in this great apartment situated so close to the sea and close tho restaurants and bars. It couldn't be better than this. Swimming pool was not crowded and very clean with plenty of sunbeds available. The sea views are stunning and it's amazing to walk in the morning and in the evening along the beach. Overall we had great experience and hope to come back again to Golf del Sur. Thank you Gordon for letting us stay there! Thank you Mirela for your very kind 5 star review. You are very welcome to stay again. This apartment is wonderfully located and has all the facilities you could need. It is also very safe as it is in a gated community. There are plenty of bars and restaurants within a comfortable walking distance. On the waterfront is an excellent path for a good walk along the seashore. Altogether a great place to stay. Lovely stay at this huge apartment. Ideal for families this apartment had everything we needed. Owners & their local contacts more than helpful. Property felt secure, even though it is above the Wild Geese pub there was very little noise. Lovely big pool, kids pool great for them to splash around in too. Thanks for having us! Thanks for your very kind review. We have just had a new cooker installed, in passing, in case you had a problem with the old one, which we found was playing up, when we were in Tenerife recently. Is that why we missed out on the 5th star?!! You would be very welcome again. Very large apartment, large balcony’s on 3 sides. Equipped with everything you need. My husband and I had an enjoyable few weeks stay plenty of restaurants and bars nearby. Excellent communication with the owners, Gordon and Jane provided us with a detailed schedule of places to go and restaurant recommendations. Hope to return in the future. Thank you June & Robert for your very kind 5 star review. I think you said it all most succinctly. You would, of course, be most welcome again. We have just returned from a wonderful stay in this lovely apartment. It is one of the largest apartments I have stayed in with 2 separate balconies and just yards from the pool. The apartment was clean & had everything you could need. The bedrooms and bathrooms were of a good size, especially the main bedroom which had a great view of the sea. There was lots of wardrobe space with plenty of hangers and plenty of towels provided too. There were televisions, books and a CD player and the wi-fi was excellent. The complex itself is pretty & very well-maintained. The pool is one of the cleanest I have ever been in and also was a lovely temperature. There are plenty of sun beds round the pool but no umbrellas. We purchased one for 9 Euros & used the umbrella bases that were scattered about so this wasn't an issue. This was our first time to Golf del Sur and we really enjoyed the area. There are lots of lovely restaurants within walking distance & the San Blas square (which has restaurants / shops) was a 20 minute walk along the coastal path. I cannot praise Gordon, the owner, highly enough. From my first enquiry he responded promptly & with lots of information. He sent the key to us before we left the UK & gave us full instructions on how to reach the apartment. Nothing was too much trouble for him and he obviously takes great pride in his apartment and looking after his guests. Thank you Lucinda for your very kind and generous review. It is so nice to hear that our guests have really enjoyed their holiday at our lovely Duquesa complex, which is maintained to a very high standard and in such a pleasant area of Tenerife with excellent all round amenities. You have echoed our own feelings about our apartment and the area in which it is situated. Many thanks again. You would be most welcome if you decide to visit Tenerife in the future. Thank you James for your 5 star review - much appreciated. Certainly, the Duquesa complex in Golf del Sur is one of the nicest complexes in the area with a lovely pool area and always kept in tip top condition. As you say, plenty to do in the immediate area and further afield if you hire a car. Golf del Sur is in the south of Tenerife, a 15 minute drive from the Reina Sofia Airport. The development is built around three quality golf courses, all within walking distance. Outdoor flat green bowls is also available on 'The Golf'. There are many bars and restaurants in the area with a bus going to the commercial centre, San Blas. Here you can wander around the square, away from the traffic and find banks, doctor, chemist, large supermarket and a great variety of shops. It is a quiet relaxing area in contrast to Playa de las Americas. The pleasant year round climate makes it an ideal getaway in the winter. Golf: Golf del Sur has a 27 hole course, of which you can play 18 holes as a normal round. The combination gives you a beautifully laid out course, with wide fairways, fairly large but challenging greens with black volcanic sand bunkers to cause a problem for the wayward shot. Nearly always sunny but sometimes windy with lovely views of the sea, countryside and of the many varied plants and palm trees. Sufficiently hard for the low handicapper but still enjoyable for the 'hacker'! Currently guests have to pay Home Away when booking with a minimum deposit depending on how long they are staying. All payments are returnable if the holiday is cancelled 60 days before departure - see HomeAway Terms and Conditions.